Win an iPad mini 3 For Submitting/Promoting Your Websites! 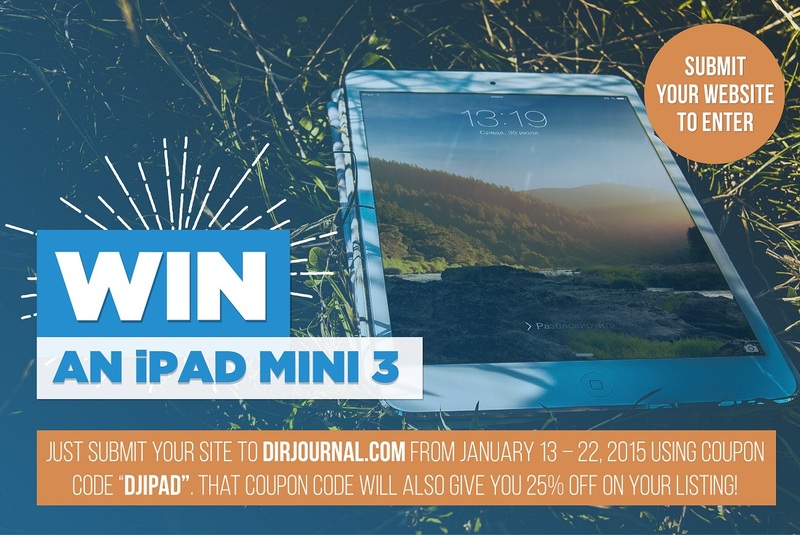 How to Enter — To be eligible to win one of our prizes (including the iPad mini 3) just submit your site to our directory from January 13 – 22, 2015 using coupon code DJIPAD. That coupon code will also give you 25% off on your listing! Multiple Entries – You will be entered into the contest once per directory submission. So if you submit multiple listings, you can increase your number of entries (and your chance to win). Eligibility — The first prize iPad mini 3 can be shipped only to residents in the United States. Applicants from other countries are welcome to enter, but they will be given the cash equivalent via PayPal. Non-U.S. residents who cannot accept payment through PayPal are not eligible for the cash prizes. What are you waiting for? Win or lose, you can save on all directory submissions in January when you use the coupon code DJIPAD. Save 25% on submissions. Be entered into our contest for an iPad mini and other prizes. And promote your sites (or your clients’ sites) at the same time. What’s not to love? Enter today! Summer Savings: Coupon Code Inside!